THE object of the earlier part of this book of the Acts is to trace the steady, gradual development of the Church among the Jews, the evolution, never ceasing for a moment, of that principle of true catholic and universal life which the Master implanted within her, and which never ceased working till the narrow, prejudiced, illiberal little company of Galileans, who originally composed the Church, became the emancipated Church of all nations. This process of development was carried on, as we have already pointed out, through the agency of the Hellenistic Jews, and specially of the deacons who were so intimately connected with that class. We have in the last few chapters surveyed the history of one deacon, St. Stephen; we are now led to the story of another, St. Philip. His activity, as described in the eighth chapter, runs upon exactly the same lines. St. Stephen proclaims the universal principles of the gospel; St. Philip acts upon these principles, going down to the city of Samaria, and preaching Christ there. The prominent position which the deacons had for the time taken is revealed to us by two notices. Philip leaves Jerusalem and goes to Samaria, where the power of the high priest and of the Sanhedrin does not extend, but would rather be violently resisted. Here he is safe for the time, till the violence of the persecution should blow over. And yet, though Philip has to leave Jerusalem, the Apostles remain hidden by the obscurity into which they had for a little fallen, owing to the supreme brilliancy of St. Stephen: "They were all scattered abroad except the Apostles." The deacons were obliged to fly, the Apostles could remain: facts which sufficiently show the relative positions the two classes occupied in the public estimation, and illustrate that law of the Divine working which we so often see manifesting it self in the course of the Church’s chequered career, the last shall be first and the first last. God, on this occasion, as evermore, chooses His own instruments, and works by them as and how He pleases. I This reticence and obscurity of the Apostles may seem to us now somewhat strange, as it certainly does seem most strange how the Apostles could have remained safe at Jerusalem when all others had to fly. The Apostles naturally now appear to us the most prominent members of the Jerusalem, nay, farther, of the Christian Church throughout the world. But then, as we have already observed, one of the great difficulties in historical study is to get at the right point of view, and to keep ourselves at that point under very varying combinations of circumstances. We are apt to fling ourselves back, or, if the expression be allowed, to project ourselves backwards into the past, and to think that men must always have attributed the same importance to particular persons or particular circumstances as we do. We now see the whole course of events, and can estimate them, not according to any mere temporary importance or publicity they may have attained, but according to their real and abiding influence. Viewing the matter in this light, we now can see that the Apostles were much more important persons than the deacons. But the question is, not how we regard the Apostles and the deacons, but how did the Sanhedrin and the Jews of Jerusalem in Stephen’s and Philip’s time view these two classes. They knew nothing of the Apostles as such.141 They knew of them simply as unlearned and ignorant men, who had been once or twice brought before the Council. They knew of Stephen, and perhaps, too, of Philip, as cultured Grecian Jews, whose wisdom and eloquence and persuasive power they were not able to resist; and it is no wonder that in the eyes of the Sadducean majority, who then ruled the Jewish senate, the deacons should be specially sought out and driven away. The action of the Apostles themselves may have conduced to this. Here let us recur to a thought we have already touched upon. We are inclined to view the Apostles as if the Spirit which guided them totally destroyed their human personality and their human feelings. We are apt to cherish towards the Apostles the same reverential but misleading feeling which the believers of the early church cherished towards the prophets, and against which St. James clearly protested when he said, "Elijah was a man of like passions with ourselves." We are inclined to think of them as if there was nothing weak or human or mistaken about them, and yet there was plenty of all these qualities in their character and conduct. The Apostles were older than the deacons, and they were men of much narrower ideas, of a more restricted education. They had less of that facility of temper, that power of adaptation, which learning and travel combined always confer. They may have been somewhat suspicious too of the headlong course pursued by Stephen and his fellows. Their Galilean minds did not work out logical results so rapidly as their Hellenistic friends and allies. They had been slow of heart to believe with the Master. They were slow of heart and mind to work out principles and to grasp conclusions when taught by His servants and followers. The Apostles were, after all, only men, and they had their treasure in earthen vessels. Their inspiration, and the presence of the Spirit within their hearts, were quite consistent with intellectual slowness, and with mental inability to recognise at once the leadings of Divine Providence. It was just then the same as it has ever been in Church history. The older generation is always somewhat suspicious of the younger. It is slow to appreciate its ideas, hopes, aspirations, and it is well perhaps that the older generation is suspicious, because it thus puts on a drag which gives time for prudence, forethought, and patience to come into play. These may appear very human motives to attribute to the Apostles, but then we lose a great deal of Divine instruction if we invest the Apostles with an infallibility higher even than that which Roman Catholics attribute to the Pope. For them the Pope is infallible only when speaking as universal doctor and teacher, a position which some among them go so far as to assert he has never taken since the Church was founded, so that in their opinion the Pope has never yet spoken infallibly. But with many sincere Christians the Apostles were infallible, not only when teaching, but when thinking, acting, writing on the most trivial topics, or discoursing on the most ordinary subjects. II Let us now turn our attention to Philip and his work, and its bearing on the future history and development of the Church. Here, before we go any farther, it may be well to note how St. Luke gained his knowledge of the events which happened at Samaria. We do not pretend indeed, like some critics, to point out all the sources whence the sacred writers gathered their information. Any one who has ever attempted to write history of any kind must be aware how impossible it often is for the writer himself to trace the sources of his information after the lapse of some time. How much more impossible then must it be for others to trace the original sources whence the sacred or any other ancient writers derived their knowledge, when hundreds and even thousands of years have elapsed. Our own ignorance of the past is a very unsafe ground indeed on which to base our rejection of any ancient document whatsoever. It is well, however, to note, where and when we can, the sources whence information may have been gained, and fortunately this book of the Acts supplies us with instruction on this very point. A quarter of a century later the same Saul who, doubtless, helped to make St. Philip fly on this occasion from Jerusalem, was dwelling for several days beneath his roof at Caesarea. He was then Paul the Apostle of the Gentiles, who bore in his own person many marks and proofs of his devotion to the cause which Philip had proclaimed and supported while Paul was still a persecutor. The story of the meeting is told us in the twenty-first chapter of this book. St. Paul was on his way to Jerusalem to pay that famous visit which led to his arrest, and, in the long run, to his visit to Rome and trial before Caesar. He was travelling up to Jerusalem by the coast road which led from Tyre, where he landed, through Caesarea, and thence to the Holy City. St. Luke was with him, and when they came to Caesarea they entered into the house of Philip the Evangelist, with whom they abode several days. What hallowed conversations St. Luke must there have listened to! How these two saints, Paul and Philip, would go over the days and scenes long since past and gone! How they would compare experiences and interchange ideas; and there it was that St. Luke must have had abundant opportunities for learning the history of the rise of Christianity in Samaria which here he exhibits to us. Let us now look a little closer at the circumstances of the case. The place where Philip preached has raised a question. Some have maintained that it was Samaria itself, the capital city, which Philip visited and evangelised. Others have thought that it was a city, -some indefinite city of the district Samaria, probably Sychar, the town where our Lord had taught the Samaritan woman. Some have held one view, some the other, but the Revised Version would seem to incline to the view that it was the capital city which St. Philip visited on this occasion, and not that city which our Lord Himself evangelised. It may to some appear an additional difficulty in the way of accepting Sychar as the scene of St. Philip’s ministry, that our Lord’s work and teaching some five years previously would, in that case, seem to have utterly vanished. Philip goes down and preaches Christ to a city which knew nothing of Him. How, some may think, could this have possibly been true, and how could such an impostor as Simon have carried all the people captive, had Christ Himself preached there but a few short years before, and converted the mass of the people to belief in Himself? Now I maintain that it was Samaria, the capital, and not Sychar, some miles distant, that Philip evangelised, but I am not compelled to accept this view by any considerations about Christ’s own ministry and its results. Our Lord might have taught in the same city where Philip taught, and in the course of five years the effect of His personal ministry might have entirely vanished. There is no lesson more plainly enforced by the gospel story than this: Christ’s own personal ministry was a comparatively fruitless one. He taught the Samaritan woman, indeed, and the people of the city were converted, as they said, not so much by her witness as by the power of Christ’s own words and influence. But then the Holy Ghost was not yet given, the Church was not yet founded, the Divine society which Christ, as the risen Saviour, was to establish, had not yet come into existence; and therefore work like that done at Samaria was a transient thing, passing away like the morning cloud or the early dew, and leaving not a trace behind. Christ came not to teach men a Divine doctrine, so much as to establish a Divine society, and, till this society was established, the work done even by Christ Himself was a fleeting and evanescent thing. The foundation of the Church as a society was absolutely necessary if the doctrine and teaching of Christ were to be preserved. The article of the creed, "I believe in the Holy Catholic Church," has been neglected, slighted, and undervalued by Protestants. 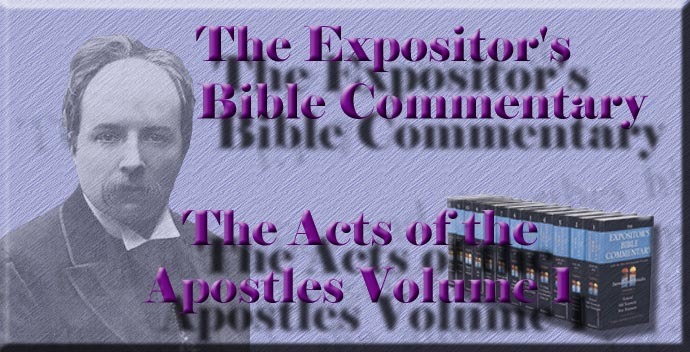 I have heard even of avowed expositors of the Apostles’ Creed who, when they came to this article, have passed it over with a hasty notice because it did not fit into their narrow systems. And yet here again the Supreme wisdom of the Divine plan has been amply vindicated, and the experience of the New Testament has shown that if there had not been a Church instituted by Christ, and established with Himself as its foundation, rock, and chief corner-stone, the wholesome doctrine and the supernatural teaching of Christ would soon have vanished. I am here indeed reminded of the words and experience of one of the greatest evangelists who have lived since apostolic times. John Wesley, when dealing with a cognate subject, wrote to one of his earliest preachers about the importance of establishing Methodist societies wherever Methodist preachers found access, and he proceeds to urge the necessity for doing so on precisely the same grounds as those on which we explain the failure of our Lord’s personal ministry, so far at least as present results were concerned. Wesley tells his correspondent that wherever Methodist teaching alone has been imparted, and Methodist societies have not been founded as well, the work has been an utter failure, and has vanished away. III St. Philip went down, then, to Samaria and preached Christ there, and in Samaria he came across the first of those subtle opponents with whom the gospel has ever had to struggle, -men who did not directly oppose the truth, but who corrupted its pure morality and its simple faith by a human admixture, which turned its salutary doctrines into a deadly poison. Philip came to Samaria, and there he found the Samaritans carried away with the teaching and actions of Simon. The preaching of the pure gospel of Jesus Christ, and the exercise of true miraculous power, converted the Samaritans, and were sufficient to work intellectual conviction even in the case of the Magician. All the Samaritans, Simon included, believed and were baptised. This is the introduction upon the stage of history of Simon Magus, whom the earliest Church writers, such as Hegesippus, the father of Church history, who was born close upon the time of St. John, and flourished about the middle of the second century, and his contemporary Justin Martyr, describe as the first of those Gnostic heretics who did so much in the second and third centuries to corrupt the gospel both in faith and practice. The writings of the second and third centuries are full of the achievements and evil deeds of this man Simon, which indeed are related by some writers with so much detail as to form a very considerable romance. Here, then, we find a corroborative piece of evidence as to the early date of the composition of the Acts of the Apostles. Had the Acts been written in the second century, it would have given us some traces of the second-century tradition about Simon Magus; but having been written at a very early period, upon the termination of St. Paul’s first imprisonment, it gives us simply the statement about Simon Magus as St. Luke and St. Paul had heard it from the mouth of Philip the Evangelist. St. Luke tells us nothing more, simply because he had no more to tell about this first to the celebrated heretics. When we come to the second century Simon’s story is told with much more embellishment. The main outlines are, however, doubtless correct. All Christian writers agree in setting forth that after the reproof which, as we shall see, Simon Peter the Apostle bestowed upon the magician, he became a determined opponent of the Apostles, especially of St. Peter, whose work he endeavoured everywhere to oppose and defeat. With this end in view he went to Rome, as Justin Martyr says, in the reign of Claudius Caesar, and as other writers say, in the time of Nero. There he successfully deceived the people for some time. We have early notices of his success in the Imperial city. Justin Martyr is a writer who came close upon the apostolic age. He wrote an Apology for the Christians, which we may safely assign to some year about 150 A.D. At that time he was a man in middle life, whose elder contemporaries must have been well acquainted with the history and traditions of the previous century. In that first Apology Justin gives us many particulars about Christianity and the early Church, and he tells us, concerning Simon Magus, that his teaching at Rome was so successful in leading the Roman people astray that they erected a statue in his honour, between the two bridges. It is a curious fact, and one, too, which confirms the accuracy of Justin, that in the year 1574 there was dug up on the very spot indicated by Justin, the island in the Tiber, a statue bearing the inscription described by Justin, "Semoni Sanco Deo Fidio." Critics, indeed, are now pretty generally agreed that this statue was the one seen by Justin, but that it was originally erected in honour of a Sabine deity, and not of the arch-heretic as the Apologist supposed; though there are some who think that the appeal of Justin to a statue placed before men’s eyes, and about which many at Rome must have known all the facts, could not have been made on such mistaken grounds. It is not altogether safe to build theories or offer explanations based on our ignorance, and opposed to the plain, distinct statements of a writer like Justin, who was a contemporary with the events of which he speaks. It seems indeed a plausible explanation to say that Justin Martyr mistook the name of a Sabine deity for that of an Eastern heretic. But there may have been two statues and two inscriptions on the island, one to the heretic, another to the ancient Sabine god. Later writers of the second and third centuries improved upon Justin’s story, and entered into great details of the struggles between Simon and the two Apostles, St. Peter and St. Paul, terminating in the death of the magician when attempting to fly up to heaven in the presence of the Emperor Nero. His death did not, however, put an end to his influence. The evil which he did and taught lived long afterwards. His followers continued his teaching and proved themselves active opponents of the truth, seducing many proselytes by the apparent depth and subtlety of their views. Such is the history of Simon Magus as it is told in Church history, but we are now concerned simply with the statements put forward in the passage before us.143 There Simon appears as a teacher who led the Samaritans captive by his sorcery, which he used as the basis of his claim to be recognised as "that power of God which is called Great." Magic and sorcery have always more or less prevailed, and do still prevail, in the Eastern world, and have ever been used in opposition to the gospel of Christ, just as the same practices, under the name of Spiritualism, have shown themselves hostile to Christianity in Western Europe and in America. The tales of modern travellers in India and the East, respecting the wondrous performances of Indian jugglers, remind us strongly of the deeds of Jannes and Jambres who withstood Moses, and illustrate the sorcery which Simon Magus used for the deception of the Samaritans. The Jews, indeed, were everywhere celebrated at this period for their skill in magical incantations—a. well-known fact, of which we find corroborative evidence in the Acts. Bar-Jesus, the sorcerer who strove to turn the proconsul of Cyprus from the faith, was a Jew. (Ac 13:6-12) In the nineteenth chapter we find the seven sons of Sceva, the Jewish priest, exercising the same trade of sorcery; while, as is well known from references in the classical writers, the Jews at Rome were famous for the same practices. These statements of writers sacred and secular alike have been confirmed in the present age. There has been a marvellous discovery of ancient documents in Egypt within the last twelve or fifteen years, which were purchased by the Austrian government and duly transferred to Vienna, where they have been investigated. They are usually called the Fayûm Manuscripts.144 They contain some of the oldest documents now existing, and embrace among them large quantities of magical writings, with the Hebrew formulae used by the Jewish sorcerers when working their pretended miracles. So wondrously does modern discovery confirm the statements and details of the New Testament! It is not necessary now to discuss the question whether the achievements of sorcery and magic, either ancient or modern, have any reality about them, or are a mere clever development of sleight of hand, though we incline to the view which admits a certain amount of reality about the wonders performed, else how shall we account for the doings of the Egyptian magicians, the denunciations of sorcery and witchcraft contained in the Bible, as well as in many statements in the New Testament? A dry and cold age of materialism, without life and fire and enthusiasm, like the last century, was inclined to explain away such statements of the Scriptures. But man has now learned to be more distrustful of himself and the extent of his discoveries. We know so little of the spirit world, and have seen of late such strange psychological manifestations in connection with hypnotism, that the wise man will hold his judgment in suspense, and not hastily conclude, with the men of the eighteenth century, that possession with devils was only another name for’ insanity, and that the deeds of sorcerers were displays of mere unassisted human skill and subtlety.145 As it was with the Jews, so was it with the Samaritans. They were indeed bitterly separated the one from the other, but their hopes, ideas, and faith were fundamentally alike. The relations between the Samaritans and the Jews were at the period of which we treat very like those which exist between Protestants and Roman Catholics in Ulster, -professing different forms of the same faith, yet regarding, one another with bitterer feelings than if far more widely separated. So it was with the Jews and Samaritans; but the existing hostility did not change nature and its essential tendencies, and therefore as the Jews practised sorcery, so did Simon, who was a native of Samaria; and with his sorcery he ministered to the Messianic expectation which flourished among the Samaritans equally as among the Jews. The Samaritan woman testified to this in her conversation with our Lord, and as she was a woman of a low position and of a sinful character, her language proves that her ideas must have had a wide currency among the Samaritan people. "The woman saith unto Him, I know that Messiah cometh, which is called Christ: when He is come, He will declare unto us all things." Simon took advantage of this expectation, and gave himself out to be "that power of God which is called Great"; testifying by his assertion to the craving which existed all through the Jewish world for the appearance of the long-expected deliverer, a craving which we again find manifesting itself in the many political pretenders who sprang up in the regions of more orthodox Judaism, as Josephus amply shows. The world, in fact, and specially the world which had been affected with Jewish ideas and Jewish thought, was longing for a deeper teaching and for a profounder spiritual life than it had as yet known. It was athirst for God, yea, even for the living God; and when it could find nothing better, it turned aside and strove to quench the soul’s desires at the impure fountains which magic and sorcery supplied. IV Philip the Evangelist came with his teaching into a society which acknowledged Simon as its guide, and his miracles at once struck the minds of the beholders. They were miracles worked, like the Master’s, without any secret preparations, without the incense, the incantations, the muttered formulae which accompanied the lying wonders of the magician. They formed a contrast in another direction too, -no money was demanded, no personal aims or low objects were served; the thorough unselfishness of the evangelist was manifest. Then, too, the teaching which accompanied the miracles was their best evidence. It was a teaching-of righteousness, of holy living, of charity, of humility; it was transparently unworldly. It was. not like Simon’s, which gave out that he himself was some great one, and treated of himself alone; but it dealt with "the kingdom of God and the name of Jesus Christ"; and the teaching and the miracles, testifying the one to the other, came home to the hearts of the people, leading them captive to the foot of the Cross. It has often been a debated question whether miracles alone are a sufficient evidence of the truth of a doctrine, or whether the doctrine needs to be compared with the miracles to see if its character be worthy of the Deity. The teaching of the New Testament seems to, be plainly this, that miracles, in themselves, are not a sufficient evidence. Our Lord warns His disciples that deceivers shall one day come working mighty signs and wonders, so as to lead astray, if it be possible, even the very elect; and He exhorts His disciples to be on their guard against them. But while miracles alone are no sufficient evidence of the truth of a doctrine, they were a very needful assistance to the doctrines of the gospel in the age and country when and where Christianity took its rise. Whether the sorcery and magic and wonders of Simon, and the other false teachers against whom the Apostles had to contend, were true or false, genuine or mere tricks, still they would have given the false teachers a great advantage over the preachers of the gospel, had the latter not been armed with real divine supernatural power which enabled them, as occasion required, to fling the magical performances completely into the shade. The miraculous operations of the Apostles seem to have been restricted in the same way as Christ restricted the working of His own supernatural power. The Apostles never worked miracles for the relief of themselves or of their friends and associates. St. Paul was detained through infirmity of the flesh in Galatia, and that infirmity led him to preach the gospel to the Galatian Celts. He did not, perhaps he could not, employ his. miraculous power to cure himself, just as our Lord refused to use His miraculous power to turn stones into bread. St. Paul depended upon human skill and love for his cure, using probably for that purpose the medical knowledge and. assistance of St. Luke, whom we find shortly afterwards in his company.146 Miraculous power was bestowed upon the first Christian teachers, not for the purposes of display or of selfish gratification, but simply for the sake of God’s kingdom and man’s salvation. And as it was with St. Paul so was it with his companions. Timothy was exhorted to betake himself to human remedies to cure his physical weakness, while when another apostolic man, Trophimus, was sick, he was left behind. by the Apostle at Miletus till he should get well. (2Tim 4:20) Miracles were for the sake of unbelievers, not of believers, and for this purpose we cannot see how they could have been done without, under the circumstances in which the gospel was launched into the world. Man’s nature had been so thoroughly corrupted, the whole moral atmosphere had been so permeated with wickedness, the whole moral tone of society had been so terribly lowered, that the Apostles might have come preaching the purest morality, the most Divine wisdom, and it would have fallen on ears so deaf, and eyes so blind, and hearts so seared and hardened, that it would have had no effect unless they had possessed miraculous power which, as occasion demanded, served to call attention to their teaching. But when the preliminary barriers had been broken down, and the miracles had fulfilled their purpose, then the preaching of the kingdom of God and the name of Jesus Christ did their work. Here again a thought comes forward on which we have already said a little. The subject matter of Philip’s preaching is described in the fifth verse as Christ, "Philip went down to the city of Samaria, and proclaimed unto them the Christ," and then in the twelfth verse it is expanded for us into "the kingdom of God and the name of Jesus Christ." These two subjects are united. The kingdom of God and the name of Jesus Christ. The Apostles taught no diluted form of Christianity. They preached the name of Jesus Christ, and they also taught a Divine society which He had established and which was to be the means of completing the work of Christ in the world. Our Lord Jesus Christ and His Apostles recognised the great truth, that a mere preaching of a philosophical or religious doctrine would have been of very little use in reforming the world. They therefore preached a Church which should be the pillar and ground of the truth, which should gather up, safeguard, and teach the truth whose principles the Apostles set forth. To put it in plain language, the Evangelist St. Philip must have taught the doctrine of a Church of Jesus Christ as well as of a doctrine of Jesus Christ. Had the doctrine of Jesus Christ been taught without and separate from the doctrine of a Church, the doctrine of Christ’s person and character might have vanished, just as the doctrine of Plato or Aristotle or that of any of the great ancient teachers vanished. But Jesus Christ had come into the world to establish a Divine society, with ranks, gradations, and orderly arrangements; He had come to establish a kingdom, and they all knew then what a kingdom meant. For the Greek, Roman, or Jewish mind, a kingdom meant more even than it does for us. It meant in their conceptions a despotism where the king ordered and did just what he liked. The Romans, in fact, abominated the name king, and invented the term emperor instead, because for them the word king connoted what it does not connote for us, the possession and exercise of absolute power. Yet, for all this, the Apostles preached Christ as a King and His society as a kingdom, because in that new society which He had called into existence, the graces, the gifts, the offices of the society are totally dependent upon and entirely subservient to Jesus Christ alone. How wondrously the life, the activity, the fervour and power of the Church would have been changed had this truth been always recognised. The Church of Jesus Christ, as regards its hidden secret life, is a despotism. It depends upon Christ alone. It depends not upon the State, not upon man, not upon wealth or position or earthly influences of any kind: it depends upon Christ alone. The Church has often forgot this secret of its strength. It has trusted in the arm of flesh, and has relied upon human patronage and power, and then it has grown, perhaps, m grandeur and importance as far as the world is concerned; but, as it has grown in one direction, it has lost in the other, and that the only direction worthy a Church’s attention. The temptation to rely on the help of the world alone has assailed the Church in various ways. It assails individual Christians, it assails congregations, it assails the Church at large. All of them, whether individuals, congregations, or churches, are apt to imagine that power and prosperity consist in wealth, or worldly position, or the number of adherents, forgetting that Christ alone is the source of power to the Church or to individual souls, and that where He is wanting, no matter what may be the outward appearance, or the numerical increase, or the political influence, there indeed all true life has departed. V The results of Philip’s teaching and work in Samaria were threefold. (1) The Samaritans believed Philip, and among the believers was Simon. There are some people who teach faith and nothing else, and imagine that if they lead men to exercise belief then the whole work of Christianity is done. This incident at the very outset of the Church’s history supplies a warning against any such one-sided teaching. The Samaritans believed, and so did Simon the Magician, who had for long deceived them. The very same word is used here for the faith exercised by the Samaritans and by Simon, as we find used to describe the belief of the three thousand on the day of Pentecost, or of the Philippian jailer who accepted St. Paul’s teaching amid all the terror. of the earthquake and the opened prison. They were all intellectually convinced and had all accepted the Christian faith as a great reality. Intellectual faith in Christ is the basis on which a true living faith which works by love is grounded. A faith of the heart which is not based on a faith of the head is very much akin to a superstition. Of course we know that there are people whose faith is deep-rooted and fruitful who cannot state the grounds of their belief, but they are well aware that others can thus state it, that their faith is capable of being put into words and defended in argument. Intellectual faith in Christianity must ever be regarded as a gift of the Holy Ghost, according to that profound word of the Apostle, "No man can say, Jesus is Lord, but in the Holy Ghost." But intellectual faith in the truth and reality of Christ’s mission may exist in a heart where there is no sense of sin and of spiritual want, and then belief in Christ avails nothing. There were cravings after righteousness and peace in Samaritan bosoms, but there was none in one heart, at least, and that heart was therefore unblessed. The results of St. Philip’s work teaches us that faith is not everything in the Christian life. (2) Again, we find that another result was that the Samaritans were all baptised, including their arch-deceiver Simon. Philip, then, in the course of his preaching of Christ, must have told them of Christ’s law of baptism. The preaching of the name of Jesus Christ and of the kingdom of God must have included a due setting forth of His laws and ordinances. We do no honour to Christ when we neglect any part of His revelation. If God has revealed any doctrine or any practice or any sacrament, it must be of the very greatest importance. The mere fact of its revelation by Him makes it of importance, no matter how we, in our shortsighted wisdom, may think otherwise. Philip set forth therefore the whole counsel of God, and as the result all the Samaritans were baptised, including Simon; but then again, as Simon’s case taught that faith by itself availed not to change the heart, so Simon’s ease teaches that baptism, neither alone nor in conjunction with intellectual faith, avails to convert the soul and purify the character. God offers His graces and His blessings, faith and baptism, but unless there be receptivity, unless there be consent of the will, and a thirst of the soul and a longing of the heart after spiritual things, the graces and gifts of the Spirit will be offered in vain. (3) And then, lastly, the final and abiding result of Philip’s work was, there was great joy in that city. They rejoiced because their souls had found the truth, which alone, can satisfy the cravings of the human heart and minister a joy which leaves no sting behind, but is a joy pure and exhaustless. The joys of earth are always mixed, and the more mixed the more unsatisfying. Still chant his morning song?" The very name Apostle connotes for us an extraordinary office and dignity, placing the Twelve upon an exalted plane far above all others. But the Jewish Council knew nothing of this. The term Apostle was in common use amongst the Jews. To us it seems almost presumptuous to apply the name to any but the Twelve, though the New Testament applies it more widely. The title Apostle was given among the Jews to the legate or Church officer who attended on every synagogue and discharged its commands. It was also specially bestowed upon the messengers of the Jewish high priest or patriarch who collected the temple tax while the temple existed, and afterwards the poll tax or tribute paid by every Jew throughout the world towards the support of the patriarch and the Sanhedrin. The name Apostle is found in this sense in the Theodosian Code down to so late a period as the fifth century. Our Lord and the early Church simply adopted this title Apostle from the synagogue, as they adopted so many other rites and usages, baptism, holy communion, the various orders of the ministry, and a liturgical service. Samaria, the capital, was at this period called by the Romans Sebaste. Herod the Great rebuilt it in honour of the emperors, and erected a splendid temple there, which he inaugurated with games and gladiatorial shows. It was a suitable spot for the peculiar talents of a man like Simon Magus, as in turn it would have been specially repugnant for every reason to a strict Jew. But a Divine instinct was leading Philip on to the revelation of God's purposes of love and mercy. See Joseph., Antiqq. , XV., viii., 5; Stanley's Sinai and Palestine , p. 245. The story of the quarrels between Simon Magus and St. Peter has been used by the Tübingen school of critics in Germany to support their theory of a fundamental opposition between St. Paul and St. Peter. See Dr. Salmon's Introduction , chap. xix., for a full statement of this strange view. See about the Fayûm MSS. and their contents a series of articles in the Records of the Contemporary Review from December 1884, and in the Expositor for 1885 and 1888. These Fayûm documents go back to the remotest times, one of them being dated so long ago as 1200 B.C. It is very curious that this extraordinary discovery has been apparently overlooked by the great majority of English learned societies. Moll's work on hypnotism, which we have already several times quoted, admits the reality of Eastern magic, accounting for the mango trick which Indian jugglers perform, and which every Indian resident has seen, on the ground that even vegetables can be hypnotised. It may be hard for us to admit it, but such books compel us to allow that there may be more in heaven and earth than is dreamt of in our philosophy. The presence of the grand heathen temple at Sebaste or Samaria would have made it the fitter scene for Simon's magical incantations. Magic and Paganism always flourished side by side, as we see at Ephesus. See Acts xvi. 6-10, compared with Gal. iv. 13. The Christian Year , 2nd Sunday after Epiphany.